Doug Campbell began working in Haiti in 1986 when he accompanied Fr. Tom Hagan, OSFS, on a Lafayette College volunteer mission. Soon after, Doug joined Fr. 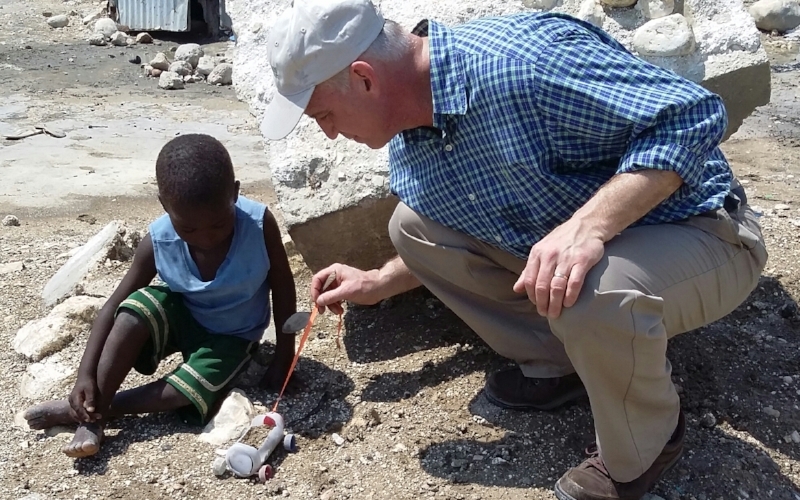 Tom in creating a the Catholic lay mission outreach program, Hands Together which serves the poorest of the poor in Haiti - particularly in Port-au-Prince's slums of Cite Soleil and the poor rural villages in the Diocese of Gonaives, Haiti. Doug splits his time between running the U.S. office in Chicopee, MA and working alongside Fr. Tom Hagan to oversee many Catholic mission outreach programs for the very poor. Their work among the violence and poverty in Haiti is founded upon the Catholic social teachings of the dignity of human life and a preferential option for the poor. Hands Together embraces a clear ethic of life based on God's infinite and absolute love for us. About one-third of Hands Together's mission work supports educational, health, charity and developmental projects in the Diocese of Gonaives where more than 1 million live in abject poverty. Doug holds a BA from Lafayette College in Easton, PA and a Masters Degree in Human Services from Springfield College in Springfield, MA. Nicole oversees Hands Together's U.S. Office after several years in Public Relations, Communications and Management. Nicole brings her PR, writing, and office management skills to manage the day to day operations and staff of the U.S. office and to assist the executive director with donor management, communications, mission appeals, and administration. Joshua joins Hands Together as Mission Appeals Coordinator. Passionate about helping others through the mission of Hands Together, Joshua is a welcome addition to the team. With several years of experience in ministry and a deep knowledge of missions, Josh will be coordinating mission appeals and working with mission directors, parishes and speakers to bring awareness of the plight of Haiti’s poor to many. Tiffany has returned to Hands Together to assist with bookkeeping and provide support to the accountant. Her sunny personality and willingness to help make her a valuable part of the team.